Check out my Patreon page! It’s a way to help support the comics I draw and it’s also a way for you to see extra cool stuff! A customer I was helping made a small comment about the artwork of a book cover with a knight in some crazy fantasy armor sporting a pair of gigantic “pauldrons.” I chuckled to myself knowing that if my brother Jason was there when he made the comic he may very well have found another friend to play Warhammer 40k with. 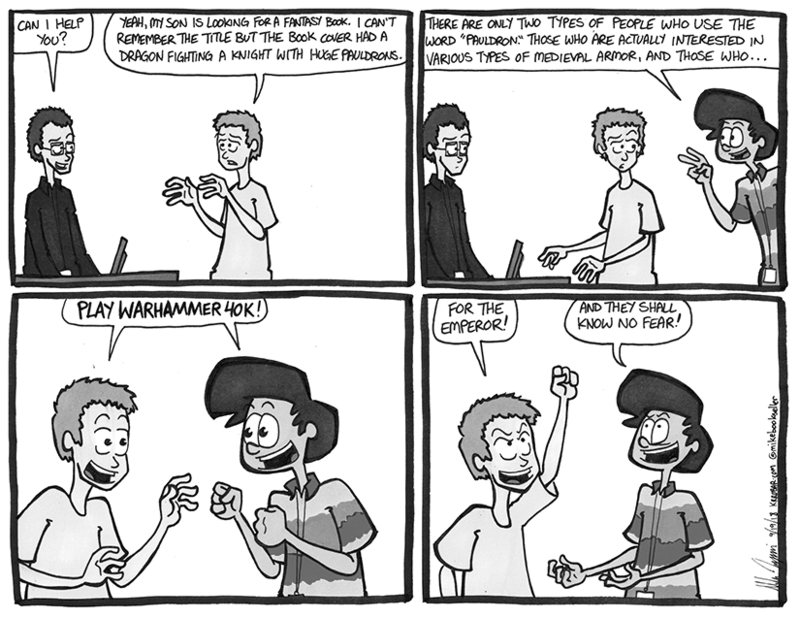 Jason’s love for Warhmammer 40k is on par with my obsession with Magic the Gathering. He watches videos online, he looks up new combinations for the figures to pair up with, he pours over magazines, and spends a lot of downtime relaxing by painting and assembling his ever growing army of tiny plastic Tau, Necrons, and Space Wolves. There’s a seriously crazy rabbit hole to fall down with this franchise. All sorts of books, strategy guides, supplemental board games… It’s a literal empire and it rewards you with even more the further you go down it and it may very well start with the word “pauldron” for some.